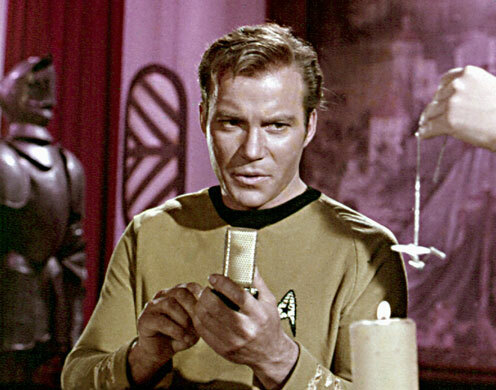 Quick Fact: The first Motorola cell phone was inspired by Captain Kirk’s famous flip communicator. With the first teaser trailer for the next Star Trek sequel hitting the web this week, fan excitement for the film stands at a fever pitch. After all, who doesn’t want to immerse themselves in a universe where fighting off four Klingon Birds of Prey while preventing a giant nuclear reactor from exploding around you is just chalked up to another typical Tuesday afternoon? While many in the mainstream see Gene Roddenberry’s brainchild as nothing more than escapist fantasy, some of Star Trek’s main storytelling staples — namely its fancy sci-fi technology — are actually quite close to becoming permanently engrained in reality. When asked how he devised the first mobile phone prototype in 1973, former Motorola vice president Martin Cooper credited Star Trek’s hand-held communicator as its inspiration. 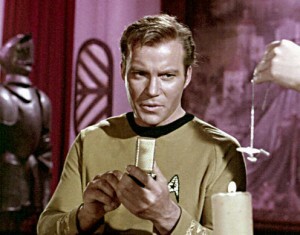 In 2013, the medical world will see the introduction of a new life-saving tool modeled after another familiar Trek creation: the medical tricorder. The Scanadu SCOUT, tagged with a retail price of $150, works very much like the science fiction device it’s affectionately based on. To check a person’s vitals, one simply places the SCOUT’s EKG-like plastic pad on the patient’s temple or behind their ear. Within seconds, the instrument will display a person’s vitals like body temperature, heart rate and cardiac electrical activity levels via a paired iPhone, iPod or Android phone app. For a more in-depth examination of a patient’s condition, users can fan the handheld unit (which is about the size of a matchbook) across a patient’s body. Using the programmed algorithms, the SCOUT will then employ a combination diagnostic tools to make a real-time medical analysis. The app also warns of outbreaks in one’s immediate area, reminds the user of needed vaccinations and doctor’s appointments, and stores medical information so you can track the progress of a sick person’s recovery. The SCOUT, along with two other devices called the ScanaFlo and ScanaFlu (which according to Jesus Diaz of Gizmodo are “disposable … portable medical labs”), are awaiting final government approval before being released to the public. But, plans are for the products to hit the marketplace around this time next year. What will this mean for the advancement of medicine? Imagine a company of United States Marines stationed in Afghanistan having the ability to diagnose and properly treat fellow soldiers and civilians when cut off from military hospitals. Think of the possibilities of doctors treating the sick in third-world countries where advanced medical equipment is unavailable with something as simple as an iPhone. These cheap devices will keep track of your own health … but they can also be easily used to detect infection outbreaks at a national or planetary level, with people anonymously uploading data to a cloud. The Center for Disease Control or the World Health Organization can literally keep their fingers on the pulse of the entire planet. Finally, a device that can help Bones become both a doctor AND a miracle worker. Have you ever wanted your very own holodeck like the one seen on Star Trek: The Next Generation? 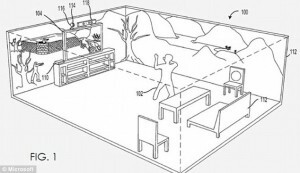 Well, thanks to the latest patents submitted by Microsoft for its Kinect peripheral, engaging in a 3-D video game experience might be here sooner that you think. A diagram of what’s in store for future Kinect users. According to the designs, instead of using a XBox 360, HDTV and hand-held controller to play platform releases, a gamer’s entire living room, den or basement becomes a giant digital sandbox where their adventures across space, football games or modern battlefield combat unfold all around them. The key to the entire setup is the Kinect device, a webcam-like console add-on which enables users to control and interact with games and other apps by using hand gestures and spoken commands. The Kinect will both send out and receive data via scanning the environment and the player’s movements to project and maintain the digital gaming landscape. Of course, these are just patents for a possible future device — it doesn’t guarantee the possibility of mass production down the line. But, if it all works out according to plan, Microsoft wants to put a holodeck in your living room. Just make sure to engage the safety protocols before playing. If getting real-time medical data through a smart phone wasn’t amazing enough, NASA has begun research to satiate man’s inherent desire to “seek out new life and new civilizations” within the universe. Recently, staff scientist Harold White announced to the world that his team began work on a hyperdrive construct based upon the ground-breaking 1994 paper written by fellow physicist Miguel Alcubierre. (You can read White’s entire findings here.) Alcubierre’s article, “The Warp Drive: Hyper-Fast Travel Within General Relativity,” proposed a mathematical equation which would allow modern-day astronauts to employ a rendition of Star Trek’s famously futuristic “warp drive” technology to propel an interstellar craft to its predetermined destination. “This loophole in general relativity would allow us to go places really fast as measured by both Earth observers, and observers on the ship — trips measured in weeks or months as opposed to decades and centuries,” Smith told io9.com. There is a drawback, however: according to the Newsy report, the amount of energy needed to propel the ship doesn’t exist in the entire universe. But, Smith told io9 that he’s tweaking Alcubierre’s algorithm to account for that variable. So let’s keep our fingers crossed. Everyone is dying to see what Alpha Centauri looks like at Christmas time.